We live on a planet that has a long and turbulent geological history, with episodes of upheaval and destruction on a massive scale alternating with periods of relative quiescence. Life on Earth has evolved throughout all these changes, has been thriving for nearly four billion years despite periods of mass extinction, and has left magnificent physical traces—fossils—of the past. Among the most spectacular fossils are petrified trees, some preserved in such exquisite detail that it takes more than a casual glance to realize that they have indeed been petrified—turned into stone. Let us take a closer look, starting with the examples below photographed in Ginkgo/Wanapum State Park near the small town of Vantage in Washington State. 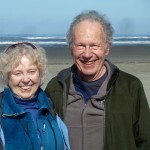 The park is situated on bluffs overlooking the Columbia River. The photograph below shows the Wanapum Reservoir as seen from the park’s interpretive center. Displayed around the interpretive center are numerous stumps and logs of petrified trees, such as the one below. 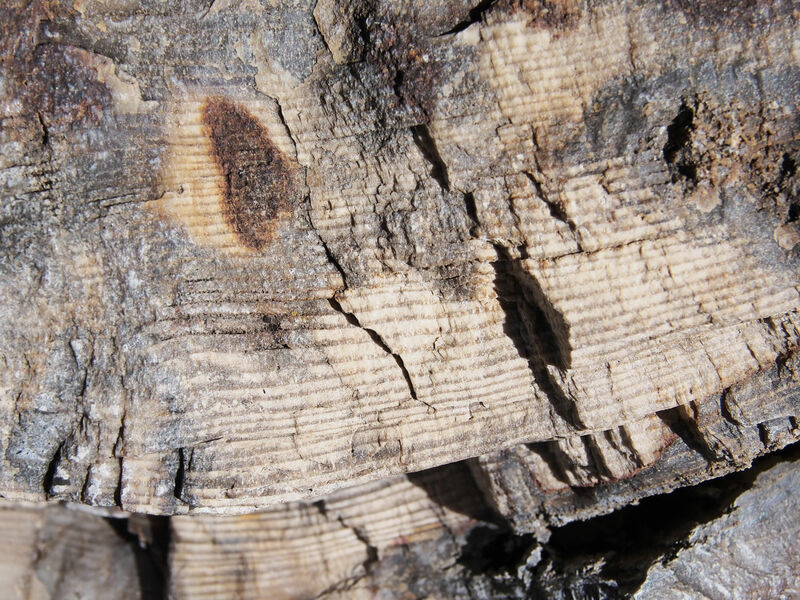 A closer view reveals how fine the preservation of this stump is, with the annual growth rings seen as clearly as in a freshly cut or broken specimen. And below is a log lying on the ground, its bark stripped off and the wood petrified. It is truly hard to distinguish it from a fresh, recently peeled log! Petrified trees are not rare among fossils and have been found in many localities on all continents, even Antarctica. In the United States there are well known sites in at least a dozen states, of which perhaps the most famous is Petrified Forest National Park in Arizona. A special feature of Ginkgo/Wanapum State Park is that an unusually large number of tree species, some forty, have been preserved there. This includes a new species of ginkgo (Ginkgo beckii). Ginkgos once were widespread around the world, but later they went extinct except for some individuals maintained in cultivation in China and possibly one isolated population in the Chinese mountains, all belonging to a single species, Ginkgo biloba. In recent times they have found favor as hardy urban trees and as a (somewhat controversial) source of therapeutic compounds. Fossilized ginkgo leaves are fairly common, but ginkgo tree trunks are extremely rare. 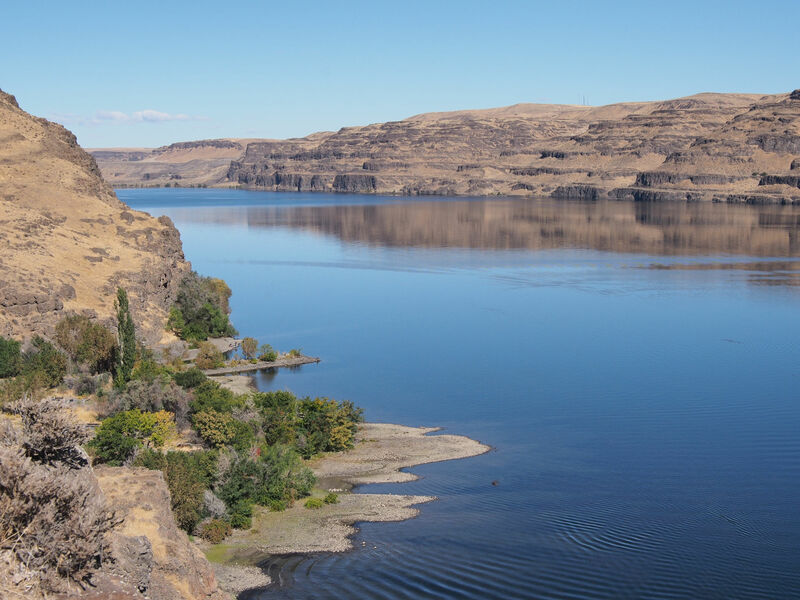 This is why the Ginkgo/Wanapum State Park was named after them, even though out of the literally hundreds of petrified trees that have been found within the park only four are ginkgos! HOW OLD ARE PETRIFIED TREES? The ages of the petrified trees found in different localities vary widely. 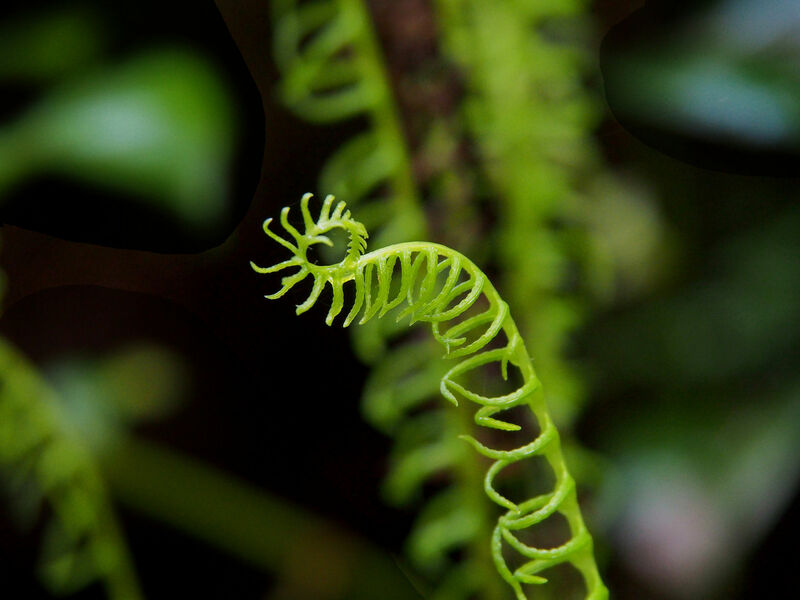 The oldest specimens known at present are in the Catskill Mountains of New York and date back around 385 million years, a time when the continents were still in the process of being colonized by plants. The form of these trees—a stout trunk with a feather duster-like array of branches at the top— was unlike that of any living trees. The petrified trees recently discovered in Antarctica are estimated to have lived 260 million years ago; those in Petrified Forest National Park, 200 million years ago. Other petrified forests are far more recent. The petrified trees found at Ginkgo/Wanapum State Park, and also in Yellowstone National Park, lived “only” about 15 million years ago. The deposition of minerals in the spaces present in living tissues. This is generally called permineralization. The actual replacement of organic molecules—in the case of wood, predominantly the cellulose and lignin out of which the walls of the cells that make up wood are made as well as the pectin that holds the cells together—by minerals. Both of these processes take time, time in the range of scores to perhaps as long as millions of years. Timing in specific instances, however, is difficult to establish with accuracy—how would you determine the actual length of a process that took place 100 million years ago? The principal chemical component in most cases of petrifaction is silica. Silica is composed of two elements, silicon and oxygen, in a ratio of one to two—silicon dioxide. The mineral form of silica, in which the silicon and oxygen atoms are arranged in highly specific geometries, is called quartz. This is what the colorless crystals often sold in gem shops are made of. Quartz is one of the most abundant minerals on Earth and is, among other things, one of the most common constituents of sand, volcanic ash, and lava. Its abundance is the main reason why it is so dominant in petrifaction. 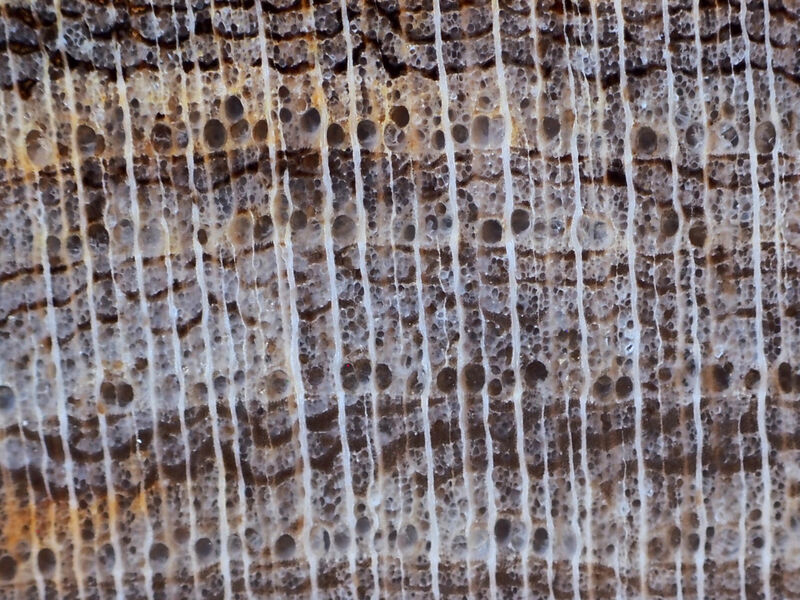 In addition, its chemical stability and its extreme hardness help it survive weathering for many millions of years following its deposition within what were originally fragile organic structures. A variety of other elements and minerals, and even water molecules, can mix with silica, leading to a range of colors and textures. Depending on the details, this mixing may result in agates or opals, which are composed predominantly of silica but are not crystalline and thus are not only colored but also structurally different from quartz. Amethysts, too, are primarily silica with somewhat altered chemistry, for example the substitution of iron atoms for some of the silicon atoms. Amethyst is crystalline and is thus a modified form of quartz. Quartz and amethyst crystals are sometimes found in cavities within petrified trees. UNDER WHAT CIRCUMSTANCES DOES PETRIFACTION TAKE PLACE? The plant tissue must not decay before it can be mineralized. Abundant minerals in water solution must be present. 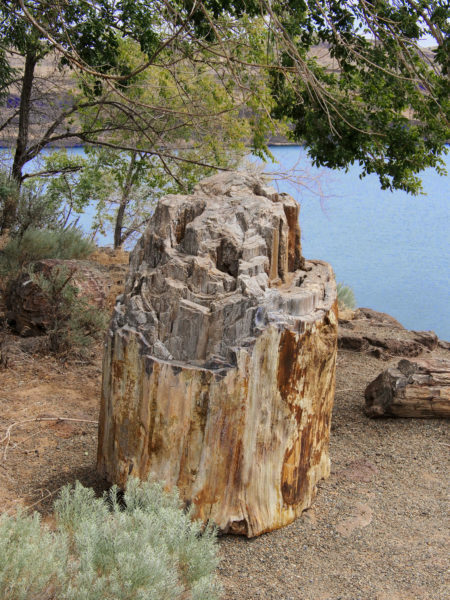 Here is what seems to have produced the petrifaction of so many trees in the region of Ginkgo/Wanapum State Park. The story has been pieced together from research that started nearly a century ago and is still evolving. 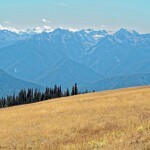 Once the area that is now the arid region of southeastern Washington and northeastern Oregon was richly covered with forests. Starting about 17 million years ago, the area experienced a series of massive lava flows, more than two hundred over a period of several million years. This lava was forced out of fissures in the ground, each of which could reach a hundred miles in length. 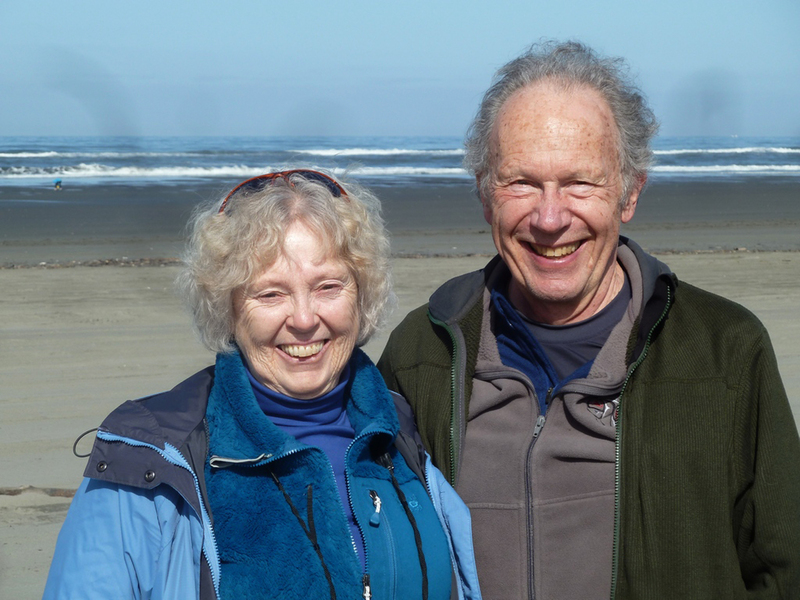 The lava was highly liquid and flowed rapidly over the Columbia Plateau, burying trees so quickly that once in a while they didn’t even have a chance to ignite. In the thousands of years between flows, new vegetation took hold on top of the cooled lava surface, only to be destroyed or buried by the next flow. At some point these flows blocked the ancestral Columbia to form a large lake. Late in the succession of lava flows, an enormous volcanic explosion in the Cascade Mountains somewhere to the northwest of Vantage occurred. Trees uprooted in the area of the volcano were carried on top of massive mudflows and accumulated in the lake, forming a massive log jam of thousands of trees. 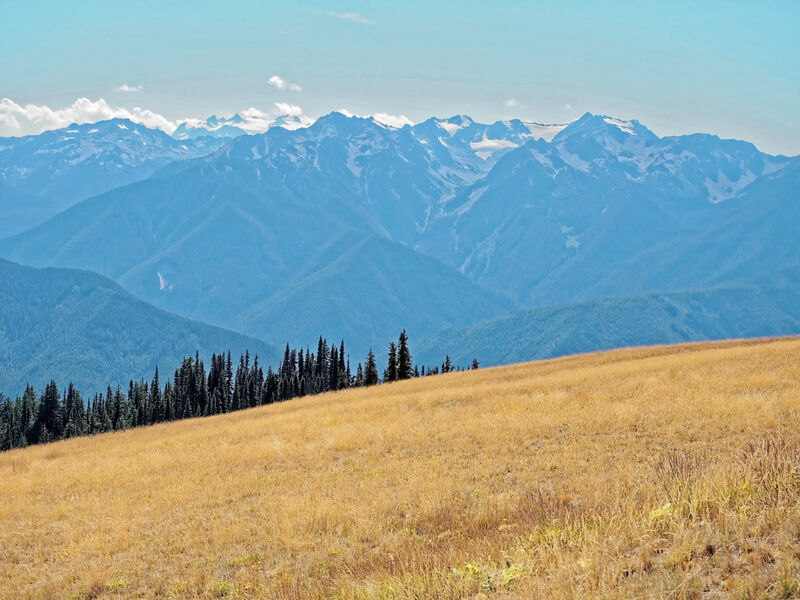 This helps explain why, despite the overall species diversity, half or more of the petrified trees at Vantage are Douglas fir (Pseudotsuga) and spruce (Picea), even though both of these species at the time were more common in the mountains than in the lowlands. 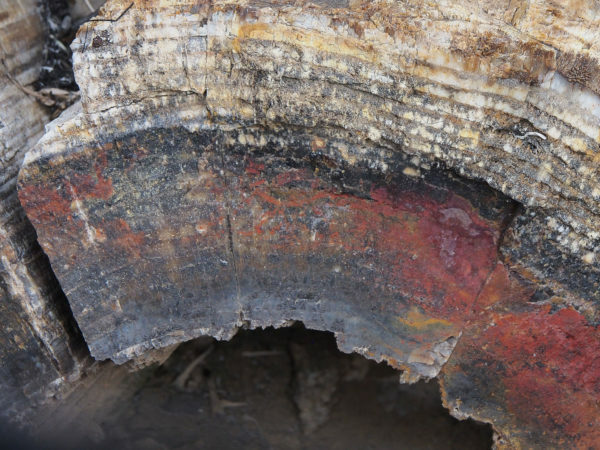 When additional flows brought fresh lava into the lake, the resulting boiling of the water and cooling of the lava created conditions under which many of the accumulated logs were buried, preserved, and mineralized. The congealed lava (basalt) in the region often contains more than 50% silica, providing ample material for both permineralization and replacement. WHAT DOES PETRIFIED WOOD LOOK LIKE ON THE INSIDE? The detailed internal structure of petrified trees is highly variable. Some of the trees still contain a substantial amount of the carbon present in the cellulose, lignin, and other molecules of which their tissues were originally constructed. In other cases, all the carbon is gone and only minerals are present. The cellular architecture may be astonishingly well preserved, or it may be entirely destroyed even though the overall structure of the trunk is intact. And, quite often, various degrees of the preservation of structure and deposition of minerals are present in a single specimen, as in the spruce (Picea) pictured below. In the upper portion of the photograph you can see typical annual growth rings, as if this were a freshly cut trunk. 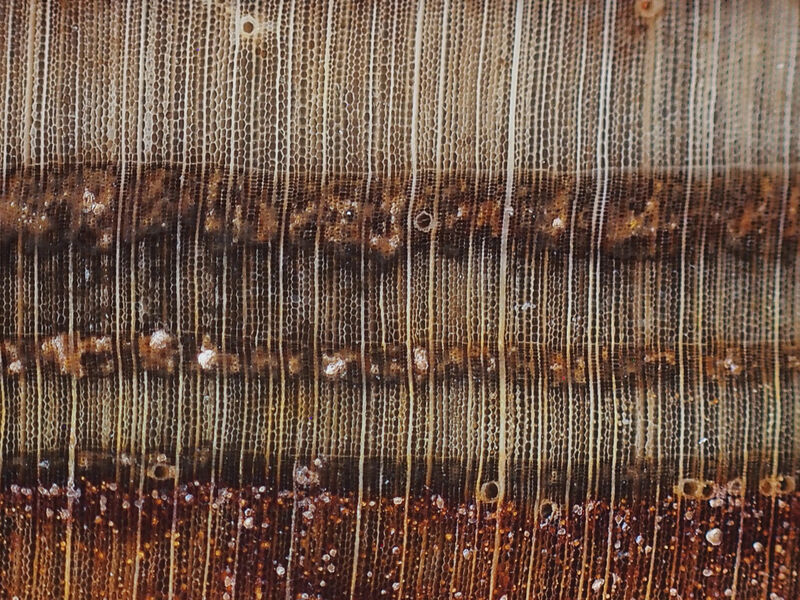 In the lower left the rings are barely visible and the color of the mineral component is much stronger. In the lower right no rings at all can be seen; the wood has been replaced by smooth stone. 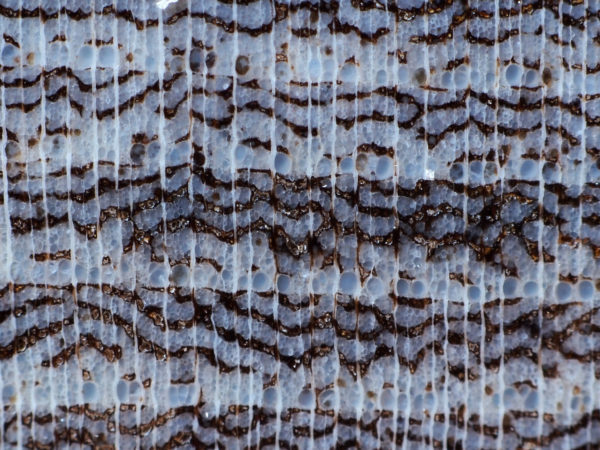 The best way to examine the detailed structure of wood, whether contemporary or petrified, is to view thin, transparent slices through a microscope. Fresh wood can be sliced to the necessary thinness with a sharp knife operated by a special instrument called a microtome. Petrified wood has to be sliced with a diamond saw and then ground to the requisite thinness. However, even a thick slab whose surface has been polished well can reveal a surprising amount of detail to a hand lens or a camera. Here are some examples. This specimen is an elm (Ulmus). The broad bands running left-to-right are the annual growth rings; three complete ones and two partial ones can be seen in the picture. 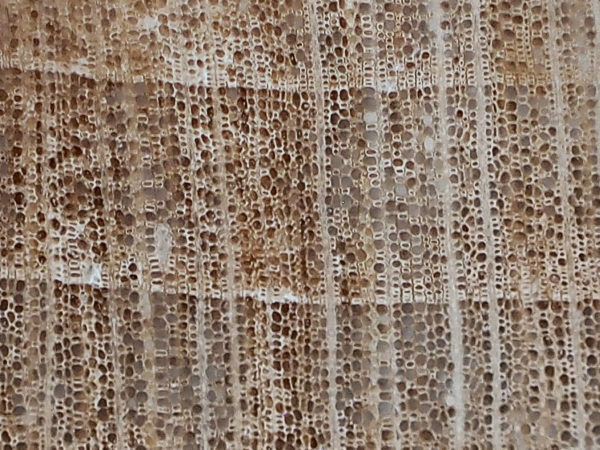 Growth rings are formed by the addition of cells from an actively-dividing cylinder of cells, called the cambium, which is situated just under the tree’s bark. 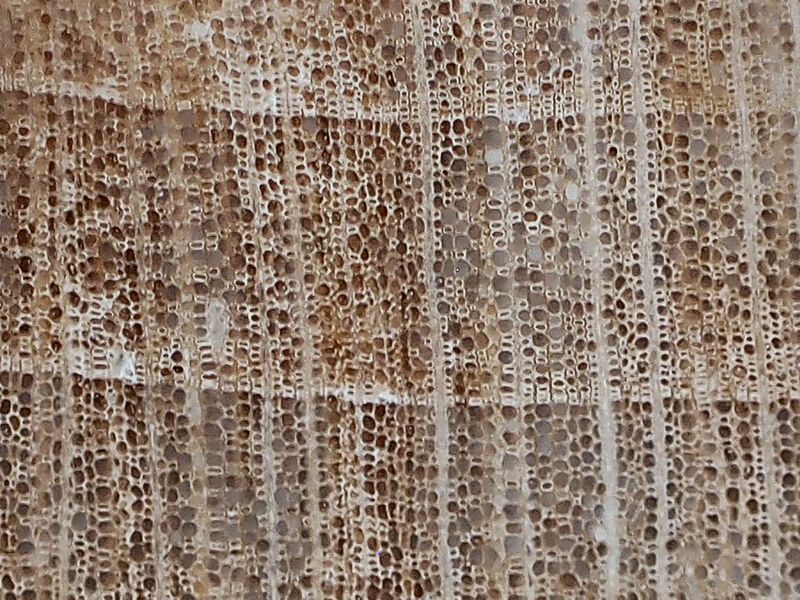 The large, bluish ovals arranged near the bottom of each ring in the picture (the ring’s oldest part) are xylem vessels, the major water-conducting cells of the wood. These form in the spring, and their large size is the main reason that the inner portion of each growth ring looks lighter than the outer portion. Later-formed vessels are smaller. The very dark, brown-colored profiles are fibers, thick-walled cells that do not conduct water but provide added strength to the wood. The wavy, intertwining arrangement of younger vessels and fibers is characteristic of elms. Finally, the thin, pale strands running top-to-bottom are “rays” of parenchyma, cells that carry nutrition from the periphery into the interior of the wood. 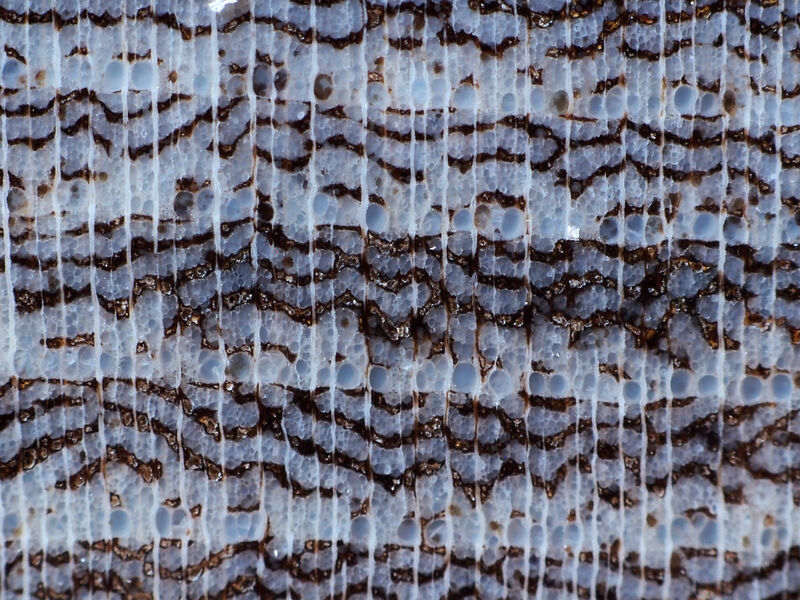 Shown above is another portion of the same specimen, offering a slightly different view of the same cellular components. Conifers and their relatives (gymnosperms) do not form xylem vessels the way flowering trees (angiosperms) do. 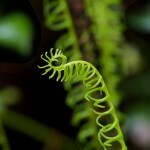 Rather, they use only cells with a rather different structure, called tracheids, to conduct water. Thus, the presence or absence of vessels is the first clue available to an investigator trying to identify a specimen: if vessels are present, the specimen is an angiosperm, if vessels are absent, the specimen is a gymnosperm. 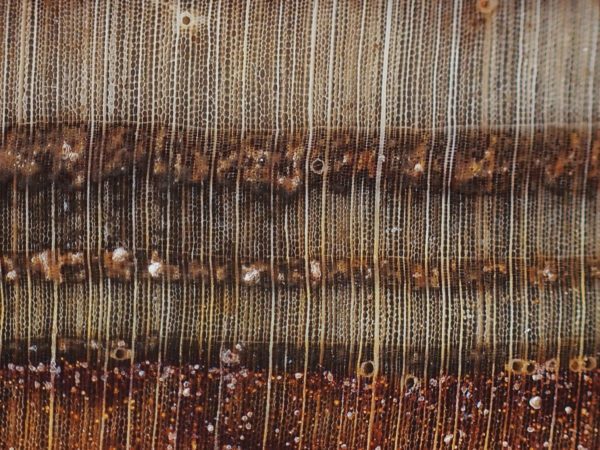 The occasional large, circular profiles seen in the specimen above are not vessels, they are resin ducts in which the familiar sticky resin of conifers travels. The specimen has not been precisely identified but is probably a Douglas fir or a spruce. Ginkgos show yet a different cellular arrangement, but still with no identifiable vessels, only tracheids. Biologists place ginkgos in a distinct group, the Division Ginkgophyta, within the gymnosperms. Remember, these specimens are 15 million years old! And we are looking merely at their cut and polished surfaces using a standard camera. The detail we can see is remarkable. Many people are thrilled by petrified wood, responding to its beauty and traveling long distances to visit rock shops where specimens can be purchased. We can appreciate petrified wood even more when we remember how it came about—that the Earth had to form, that life had to evolve, that fossilization required special circumstances, and that petrifaction is a manifestation of the orderly laws of chemistry. Looking really closely at the ethereal world of cells that is sometimes preserved within the specimen we are holding, and remembering that the specimen is millions of years old, can add yet more wonder to our experience. We are part of a truly awe-inspiring world, are we not? Oh my goodness, Johnny, this is fascinating. I have enjoyed this post so much! Thank you for sending it out. As usual, I learned a huge amount in the process of writing it! 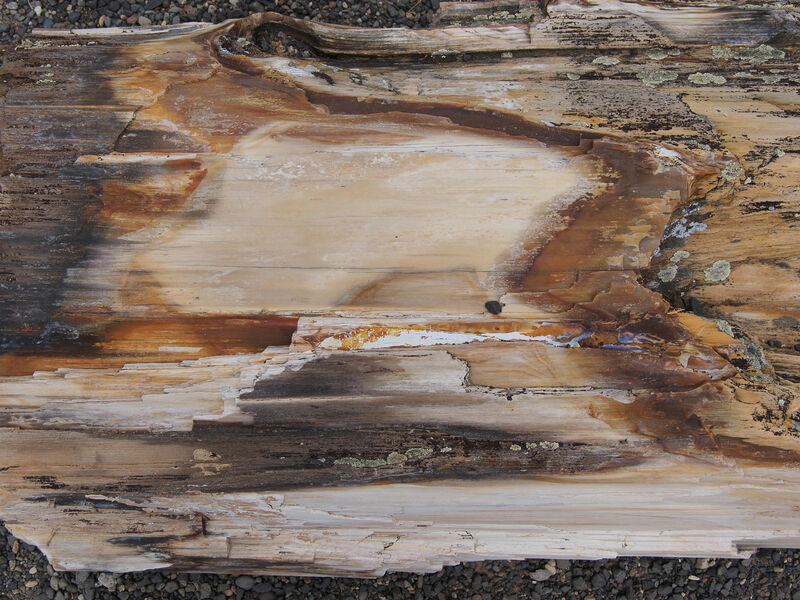 Always have enjoyed encountering petrified wood —- thanks so much Johnny for such a complete exposition..!! Loved the age details! Will have to visit the local ‘forest’—soon . A fresh story has to be developed for every location. It’s a real challenge for the geologists! Thanks for the link, Sue. The photograph is spectacular! Could these lodgepole pines, which have taken up a lot of silica, be considered to be on the way to petrifaction? As always I enjoy and appreciate these essays. I finish an essay with the satisfaction of having some previously unconnected or unclear bits of information meet some additional information and context in your essay and come into a clearer understanding. With ever more questions still to ask, of course! Another fascinating and informative blog post, Johnny. Thanks. Having read it, I don’t feel so old! It’s amazing what context will do! Thanks for a fascinating post. I love the photographs. I’ve visited the museum at Ginko several times but this post taught me new facts and reminded me of the beauty of petrified wood. Thanks, Jan. I think petrified wood shows so very clearly how understanding and appreciation can enrich one another. My uncle built a house of petrified wood, and although that doesn’t seem like a good thing to do, Im thinking that if my cousin (who now lives in the house) ever tears it down, maybe some nearby university could do some interesting analysis of the stones. You make me resolve to discuss that with her at the next family reunion. As always, thought-provoking. I’ve never heard of a house made out of petrified wood before. I wonder how your uncle cut and shaped the logs! Amazing Johnny– wonderful site. I am so happy to be aware of it now. Thanks and thanks. Thanks, Pastor Jim. I have found writing Nature’s Depths to be almost a contemplation, because it prompts me to appreciate what I experience, look beneath the surface, and even draw some life lessons from what I find. Those older writers and scientists who spoke about both a Book of Scripture and a Book of Nature sure were right! Thorough and understandable description of petrifaction! Illustrated with great photos! Thank you. It was quite a learning experience!